Twenty-year-old Henry Lau may not be a name you instantly recognize. Born and raised in Toronto, Canada, he’s an up and coming star in both the Korean and Chinese music industries as a member of Super Junior-M, the Mando-pop extension of the widely popular Korean boy band, Super Junior. Amidst all this success, how would it feel to be his brother? A-Line got the chance to talk to Henry’s older brother*, a Canadian college student, about Henry’s success. J.CHAN: It must be thrilling that your brother is becoming a success in Asia. C.LAU: It’s definitely cool to see Henry have an opportunity to rise to stardom. Before he started out, I did not know anything about SM or the Asian music industry, but I knew he was going somewhere. J.CHAN: When did he start taking up music? C.LAU: He started taking piano lessons from my mom at about four and violin lessons at seven. I think he was indifferent towards music up until junior high when his talent for performing started to show. 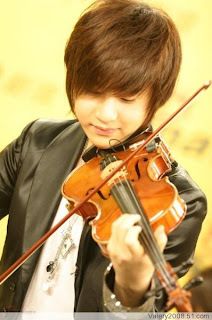 J.CHAN: As a violinist, I”m pretty envious of Henry’s technique. He must’ve won some awards, right? C.LAU: On top of local and regional violin solo competitions, he received the Silver Medal for the Royal Conservatory of Music in Canada. The Silver Medal is awarded to the soloist who obtained the highest mark in the Level 10 category. J.CHAN: Maybe I should practice more. Do you think that if Henry were a college student he would continue his passion in music? C.LAU: Definitely, specifically in music production, jazz, composition or arrangement. As a back-up, he would probably enroll in violin performance. J.CHAN: Henry was in his final year of high school before auditioning for SM, did he apply to any universities? C.LAU: After the SM auditions, Henry applied to the University of Toronto for Music Education and actually received two letters of acceptance: one for Music Education and one for Violin Performance. Currently, he’s planning to enroll part-time at Berklee College of Music in Boston during the summer to improve on his music production abilities. J.CHAN: What was Henry’s path once he was recruited by SM Entertainment? C.LAU: Henry was first engaged as a trainee at SM Entertainment and then debuted four months later with Super Junior-M.
J.CHAN: How did you feel when Henry auditioned for SM? C.LAU: I didn’t even know that he was auditioning or was serious about it! Henry always did popping and violin performances for school events and had a lot of close Korean friends who danced with him. I suspect that his friends made him aware about the auditions. J.CHAN: How did your family and friends react to the news? C.LAU: Everyone was excited to have a potential celebrity family member or friend. A month after the auditions, a Chinese speaker at SM contacted my mother. The company offered our family an all-expense included trip to Korea for us to see the environment that Henry would train in. However, only my mother and Henry were able to go. Upon returning, all doubts were put to rest and my brother had the full support of my mom. J.CHAN: I find it interesting that Henry, raised as a Chinese-Canadian, entered the Korean music industry. What were your feelings? C.LAU: Entering the Korean market was an extremely good chance to engage in a culture that he otherwise might not have had the opportunity to. There weren’t any type of prejudice that we held towards the Korean market. We only had positive connotations associated with Korea as we both love Korean food. J.CHAN: Who are Henry’s music idols? C.LAU: Especially as he is focused in producing his own music, I feel that he admires the work of J.R. Rotem and Lady Gaga’s producer. I would also think he would like to collaborate with Usher. J.CHAN: There is always a concern that young celebrities are caught up in the entertainment industry. Do you think fame has gotten to him at all? C.LAU: I think the fame definitely has taken a toll on him but not in the way you’d expect. Since he’s pretty much always on tour in Asia, he doesn’t have a lot of free time and when he does, he’s usually working on his own music. J.CHAN: Considering your brother’s success, how many people have gone up to you about him? C.LAU: Not as many people as most would expect. I do get random Facebook and MSN adds from his fans in Asia, but in person, only friends of friends ask and even then, it is more curiosity. J.CHAN: Do you usually introduce yourself as Henry’s brother? C.LAU: I usually don’t. If I do, it’s because I want to find some common ground between a new person I meet, especially if I’m abroad or meet someone from Asia. J.CHAN: Funny that I’m asking this question, but for A-Line’s female audience, what qualities does Henry like in a girl? C.LAU: One value that Henry holds highest in girl’s qualities is kindness towards others. He likes girls that are more so than average, kinder towards everyone. J.CHAN: I’ve always wondered do you ever get jealous of his spotlight? C.LAU: No. When I see Henry, he’s doing something that’s maximizing his potential and it’s not something that everyone has a chance to do. I also know that our strengths lie in different areas so when I see him in the spotlight, I am excited and proud more than anything else. *The name of Henry’s brother has been withheld upon the source’s request.